Hexperos’ third full length album, following two successful albums on Equilibrium! Hexperos is widely known and respected for their Gothic and Neoclassical chamber music. The all-new atmospheric and ethereal songs, heavenly voices, new classicism, neo folk and medieval recalls but, above all, this time we can perceive more than ever a strong celtic influence. The album reflects the musicians fascination for ancient times. 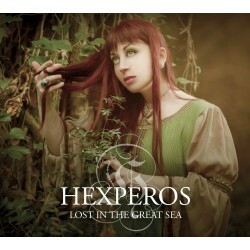 Hexperos invites the listener to hear stories full of sublime romanticism. Nature, Celticism and myths are the leitmotif of Hexperos’ music. Lost in the Great Sea mesmerizes us with the sound of ancient instruments played by brilliant musicians. This album is also full of collaborations with musicians, that contribute cello, bardic harp, hammer dulcimer, bouzouki, uillean pipes and various percussion instruments. Add to this the evocative sound of the violinists Alessandro Pensa and Domenico Mancini, who accompany Hexperos from the beginning and the charming/bewitching voices of the children’s choir directed by M° Paola Stivaletta… and last but not least, band-leader Alessandra Santovito’s flutes and gorgeous vocals, that conduct the listener through various atmospheres thanks to the wide vocal spectrum and her peculiar, elysian voiceprint!